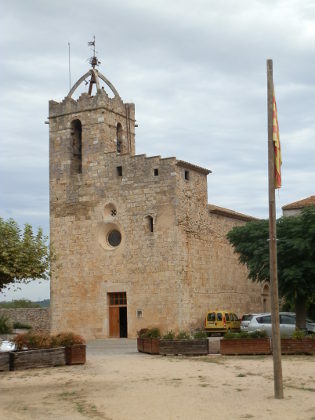 If you take the old N II (pronounced as N-two) road between Figueres and Girona instead of the AP7, then you will pass through the village of Bascara just after crossing the Fluvia river. Strategically this would have been an important crossing point for the river particularly as the village stands above the river. However, if you pass through now it's easy to miss the older part of the town which is off to the side from the main road. Older crossing points of major rivers are usually good for walking as there is normally a history to the town including a castle or tower, and a mix of geographic features, so following our visit to Sant Miquel de Flluvia, Bascara seemed to be the next interesting place along. Unfortunately we managed to get a little lost on private roads, so I've avoided putting the path we walked. To start with we park just off the main road in amongst the village itself by a playground. Bascara isn't that big and the older part consists of about 4-5 older streets leading off from a central square and street that can be reached from the main road via an old gateway. We explore a little - the area is pedestrianised and the older streets have houses with lots of plant pots outside. At the far end away from the square we reach the church which stands in its own large placa unusually a little off the centre of the town. 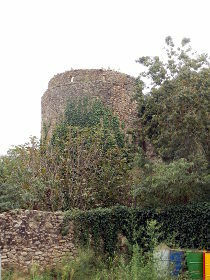 However opposite the church are the remains of the old castle - barely a tower standing and with no access to see more. The location of Bascara means that it has been under attack many times in its history. The last time when it was occupied by the French in 1808-9. The castle and church then have an open space to the town walls. The town stands about 20-30m above the river Fluvia below and, unlike the castle, the walls have been renovated. We take a path through the walls down to the river bank below. To start with we head up river. The Fluvia is quite broad at this point with a weiring system controlling the water flow. 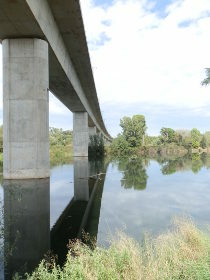 The river passes underneath a new bridge for the AVE high speed train line to Figueres. And as we follow the very pleasant river path we see that the AVE line also passes over a horse race track and equestrian centre. Horse riding is popular in the Costa Brava with a number of Gymkhanas and active riding schools and competitions all over (directly around us are 4-5 riding stables). However, until Bascara, we'd never seen a race track which was always something of a suprise given the number of holiday makers and its popularity in the UK and France (may be it's an opportunity for someone). The track itself now runs under a high (50m or so bridge for the AVE train), and is sand-based rather than grass, and though there is a riding centre there are none of the stands or paddocks you'd see in the English courses. While we were there a showjumping gymkhana was taking place with children doing dressage. Having seen the race course, we decided to turn back and go a little more downstream. We walked under the main bridge that carries the N-II and on a gravel track that headed into countryside before turning down towards the river. This was our crossing. However, the map hadn't shown that the crossing was actually a ford (quite a long broad one). 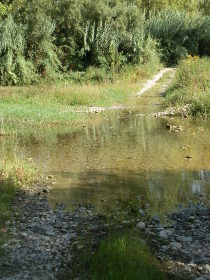 The water wasn't deep (5-10cm) but we had to take our shoes and socks off to cross to the other side. On the opposite side we followed the river back upstream to the opposite side of the river to the horse riding. The walk wasn't special, but there was a dappled light through trees and an open gravel track. The map showed a path that curled round and then climbed back up to meet the N-II bridge which should take us back to town. However, at the point we turned away from the river the track split and there was a Cami Particular sign. Unfortunately it wasn't very clear which of the two tracks it applied to. We assumed the path that went on along the river since there were further signs marking it as private. Not sure, but wanting to make a loop, we followed the track past rough fields as the track curved under a small rise. At the end of the track where we thought we could continue, the track came to an end and we found ourselves following a path that took us into the farm lands and barns that sat on top of the rise, slowly feeling more like we were in the wrong place. We could have turned back, but it would have meant a walk all the way back to the ford and knowing the buildings would have an exit at some point we pressed on. Luckily we didn't run into anyone but it was a rare occasion when we've felt we were walking somewhere we shouldn't be. Unfortunately the maps don't distinguish between public and private roads but generally the walking in Catalonia is open and relaxed and all tracks can be walked - even if you end up on a bit of a wrong track it tends to be a short connection between two paths usually because we've approached the path from the back rather than from the road. We did eventually find our way out (and it was private) and found the N-II bridge over the Fluvia back into Bascara, though the N-II is a busy road so walking the bridge wasn't too pleasant (the ford on the other hand was a lot of fun).